The Feline received a book called Prancie’s Prayer in the mail and since it was about a feline, The Tribe of Five was very interested to find out what the book was all about. Besides, we wrote a devotional book for cat lovers so the word “prayer” got our attention! Lacking opposable thumbs, Alberto and I couldn’t flip through the book and read it for ourselves, although we tried, actually Alberto tried, I am wise enough to know it would be an effort in futility. How do I get inside this thing? I give up. Will you please read this book to us? The Female Human did read us the book and we loved it! There are lots of great things in this story but I don’t want to ruin it for those of you who haven’t read it. I will say this, if you love homeless kitties, your heart will be warmed by this story and, never jump to wrong conclusions about a feline’s behavior! 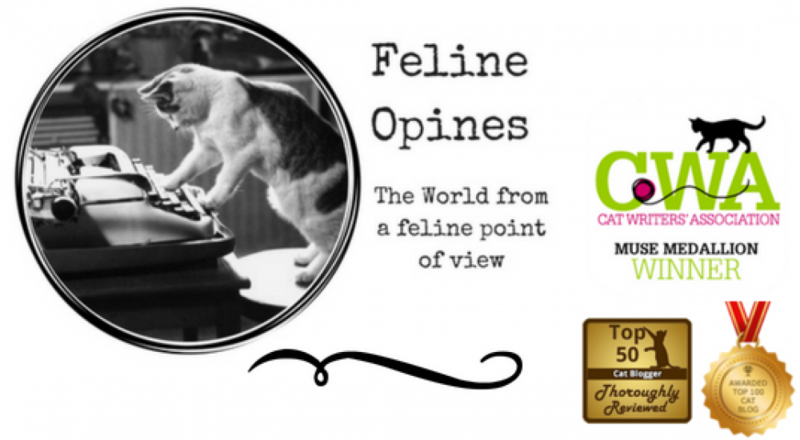 This is a Feline Opines, Tribe of Five recommended book! This entry was posted in adopting kittens, Cat adoptions, cat behavior, Cat blogs, Cat writers, Cat Writers Muse Award winning blog, cats, Christmas, Top 50 Cat Bloggers and tagged cat books, Ellen Pilch, Prancies Prayer by Feline Opines. Bookmark the permalink. Great review. I’ve read the book too and I’m giving the book to my great granddaughter for Christmas. She’s an avid reader for an 8 year old. Great review and a fun one too. That really is a terrific book! Katsu and I LOVED this book…. It would make a purrfect gift for kids and/or anyone who loves cats! We have heard such great reviews for Ms Ellen and Prancie’s book. We have it on our list of things to get for the Grands! Agreeing with you, it’s a great story! We loved this book too – such a PERFECT story for this time of year too! It’s a super book for kidlets! I haven’t gotten my paws … err … HANDS on one of these yet!